The east side of the state dominated the Associated Press’ all-state basketball awards, announced Wednesday afternoon. 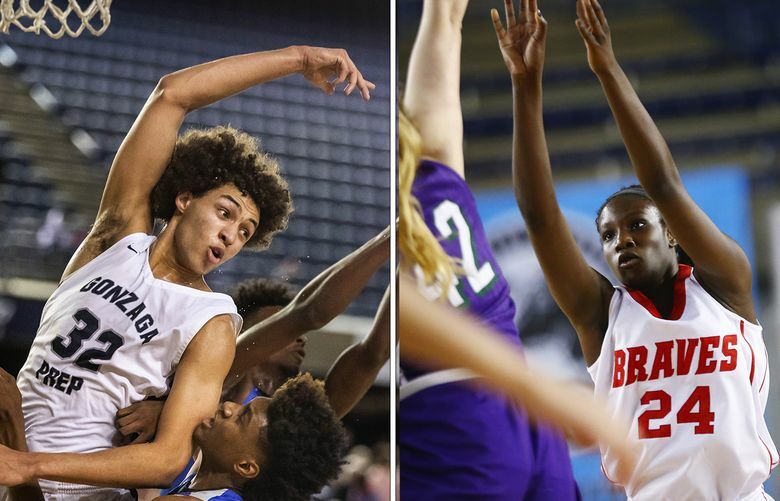 Gonzaga Prep’s Anton Watson and Kamiakin’s Oumou Toure took home player of the year honors for all classifications, while Kelso’s Shaw Anderson was named 3A boys player of the year. After leading Eastlake to its first state title this year, Keeli Burton-Oliver earned the top 4A girls honor. Watson, a four-star recruit headed to Gonzaga, is also the two-time Seattle Times boys basketball player of the year and has been named Hardwood Classic MVP the past two years, leading the Bullpups’ on back-to-back state title runs. 2B player of the year Brock Ravet, of Kittitas, will join Watson in Gonzaga’s 2019 recruiting class, while 1A player of the year Cole Bajema is headed for Michigan. Anderson, the 3A player of the year, and Lynden’s Clayton Whitman, the 2A winner, will both play for Seattle Pacific next year. Burton-Oliver, the 4A girls player of the year, committed to Arizona State after her sophomore season. She took home this year’s Hardwood Classic MVP after leading the Eastlake girls to their first state title. Top Seattle-area recruits Jaden McDaniels (Federal Way), MarJon Beauchamp (Rainier Beach) and Paolo Banchero (O’Dea) also made their respective all-classification teams. 1B: *Ross Faber, sr., Sunnyside Christian; Bryan Strom, jr. Yakama Nation; Lucas Dykstra, sr., Sunnyside Christian; Ryan Moffat, jr., Odessa; Bryce Strom, jr. Yakama Nation. 1B: *Dakota Patchen, sr., Colton; Gabi Isaak, sr., Almira-Coulee-Hartline; Maddy Dixon, soph., Pomeroy; Courtney Swan, soph., Neah Bay; Emily Schultheis, sr., Colton.